When I was searching for a perfect theme for one client, I stumbled on a Salient WordPress theme. Salient is a multipurpose theme. That means that it can be used for a business entity, blog or product presentation. 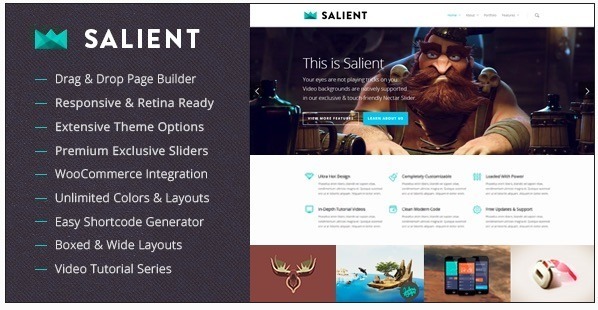 From the first look, Salient theme looks like another modern theme, but as soon as you look at the features, you will notice that this is one of the most versatile Wordpress themes. Salient has support for video headers, features paralax view with a combination with the classic navigation. You can make your website to look like the latest in modern design or you can choose a bit classical design with modern touch. 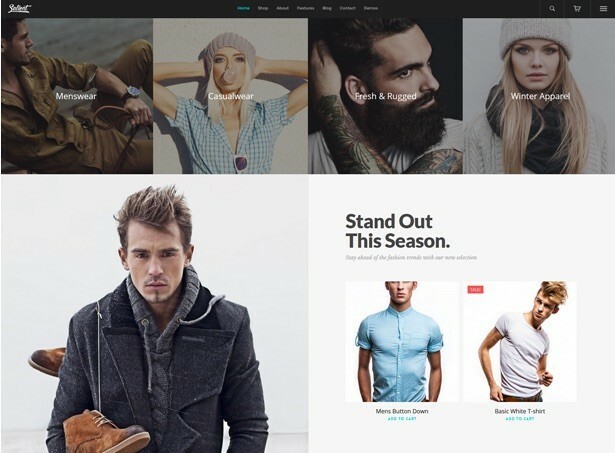 Theme has a native support for Woocommerce so you can build a great web shop. It’s also great for Portfolio websites, it has many great views. Visual composer valued at $25 is bundled in Salient theme. What’s more, it is modified by Themenectar team to better match the feel and experience. As you can see, it is so easy to build a perfect page. You just place elements and create your own design. There are infinite possibilities. 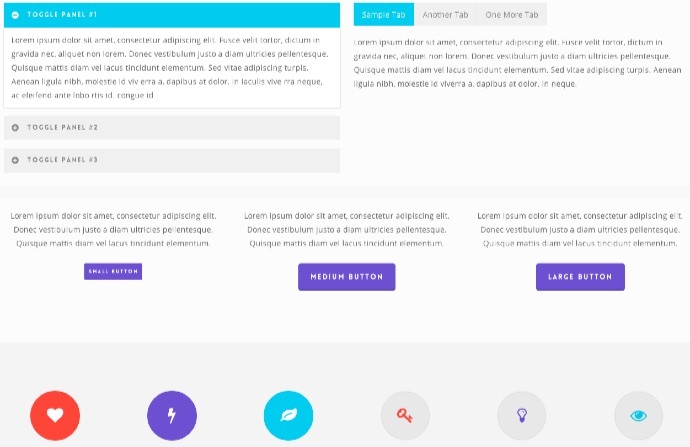 Theme features custom build elements. Animated bar graphs and Members in 2 versions. You can easily set your site to a boxed or wide layout. In addition, Salient is responsive and retina optimized. You customize headers the way you want in the most easy way. You can even have multiple headers, each for own site. Slider is a special slider developed by Themenectar team. It rocks because it has many features that are really awesome. First feature I love is a video support. You can upload videos which are then seen in the slider. I first saw this in Newrelic website and was totally blown away. Slider is hardware accelerated. It also has swipe support so that the slider can be swiped on mobile devices. Documentation is extensive. And I mean extensive. Beside plain documentation, you also have narrated Videos available so that you can see how to do something from the start. You can judge the quality of the theme by the quality of documentation. This rule applies with Salient. Quality of theme and documentation is top notch. You can import demo content and use design from demo, or you can create totally unique. set up page blocks the way you want. Sky’s the limit. Theme has support for Woocommerce, you can build the shop you always wanted or design a awesome shop for the client. Shopping cart is AJAX enabled, featuring great transitions. Authors know how important is SEO. That’s why they did everything that theme is 100% compatible with Yoast SEO plugin. In addition, code is optimized for speed which is loved by the search engines. Salient is one of the best themes for 2015. All the aspects of a quality theme are present. Optimized and clean code, SEO is at the top of priority list for the author. Documentation is great and support rocks too. Before I learned the dark side of WordPress themes, I bought several themes which were useless. Not because of design, design was great. Problem was support response time, it could take them even a week to respond. Some themes could break your ratings due to bad design. Not Salient. Salient is highly rated at 4.84 and had more than 26.900 copies sold. This two indicators tell you that author will stay in business and that take support and their users seriously. Theme, if it’s a quality one, is not often changed, updated yes, changed… rather not. So it’s important to know that you wont have any problems.